There's a stigma that most people accuse the world of: that comics, graphic novels, whatever you'd like to call them, usually are to be defined as things only for the humorous, the light, the silly~ But tackle a serious subject, of any kind never even thought of to fall into the realm of the "drawn literature" that is so often taken for granted, and it's seen as blasphemous, scandalous, or simply garish and uncouth. This work by Art Spiegelman, a true story depicting his father's experiences through his native country of Poland as a Jew, all the way to the concentration camp in Auschwitz, is an unusual, ground-breaking masterpiece that should be taken with as much seriousness as any other form of documentary performed on this universally known subject. It's form may strike many people who have been engaged with the subject previously as stunning--even to some, insulting. But I can think of nothing but tenderness, passion, empathy and a deep loving care for this work now that I have touched the first part of its magnanimous story. I have read works that have dealt time and time again with the subject of Nazi Germany, the Holocaust, and the concentration camps there. Yet there is something that we expect, something that we take with us whenever we dare to brave a story on the subject--on any of the smaller, but dynamic topics underneath that regime. We expect the horror... the fear... the mortification... the disgust... the atrocity.... We expect it to be serious, we expect it to be like the crypt--cruel, cold, and full of pain we cannot or sometimes all too well can imagine. Certainly there's no place for subjects like these in... Heaven forbid it! ...comic books. Yet here we have the astounding prodigy! That just such a medium could carry a tale in it that is so far from what we expect... this is what throws us when first we hear, "Comic books" and "Holocaust." However, it is precisely, in my opinion, that we have here something so simple, so genuinely simple before us, that makes this piece of work so moving. For though it may not be the wrenching words of a novel, though it is not the horrifying scenes of a documentary, it is a mixture of both that balances out remarkably well--and creates for us, that unusual term: a graphic novel. 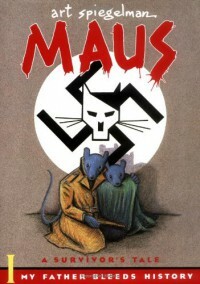 Maus is so easy to step into and experience because it is a graphic novel. Because the characters in there are not the human portrayals like what we're used to of the horrors and viciousness of the Holocaust. We have a safer entry into a subject that brings us so much pain and suffering, and that makes it easier for us to brave the horrors, to come into this story, and be ready to hear the tale it has to tell. Since I began on this topic, I would like to speak a little more about it. Vladek Spiegelman is our main character essentially: our focus, our narrator, the one we follow through his story. And for those of you who were following my status updates, you'll know that I absolutely adore his character! Is he an oddball with his quirky tendencies when we see him present day as he tells his son about what he went through? Yes he is! Does he talk with an adorably foreign method of English? Yes he does! Does he have his moments that make you go wide-eyed with concern that he just shrugs off, or moments where you're not sure whether to laugh or shake your head because of all of the fussy arguments he gets into with his wife? Yeah~ You experience all that too! But the best part is that for all his humorous and charming qualities that come with age, you still see a character that in his youth was strong, was determined, and was a good man. He was someone that swiftly charmed me with his straightforwardness, his devotion to his family and his wife (and even HER family! ), and his overall common sense in times of great danger. Did he get in trouble? Yes. But did he shine through as that hardened rock in the midst of a great sea of chaos? He did. He really, truly did. The way he was always there for his wife when she had her nervous breakdowns, or how he took the time and effort to keep her safe, to keep her sane and to be that solid and protecting figure that she needed through this toughest time--all these things are marks of character that you just don't make up. They're proved by a person's actions, and never their words. Even the way he looked out for family and friends. If he knew a way to help them, he did: whether it was providing food, or helping someone to find a place where they can safely hide from the Nazis--there was even a point or two where he went completely out of his way to help perfect strangers! He is a character that, when enduring the greatest of persecutions, shone like the most precious of gems. He's a character so easy to love and relate to. It makes reading his story... all the more powerful.